Twitter announced last December that they were going to make it possible for any Twitter user to download a full archive of all their tweets. Since then I have been occasionally checking my Settings in Twitter to see if the Your Twitter archive option had yet appeared, and today it did. Wohoo! The option when clicked, creates your archive, and then emails you a link to download it in zipped form. Even more useful is that the archive is searchable and it contains links to the original tweets on Twitter. I mentioned this on Facebook where Darren Barefoot spotted it and commented that he’d created a word cloud from his archive. Nice idea I thought. 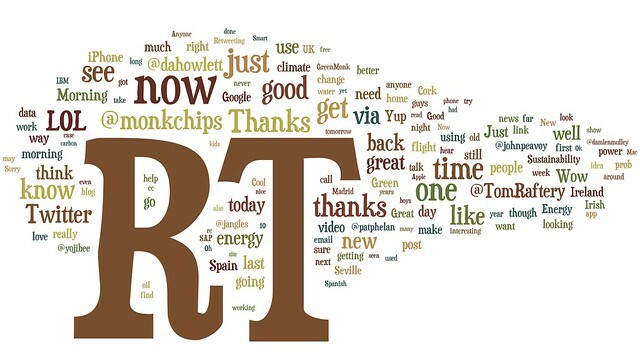 I was interested to see in the word cloud which emerged just how much I use the old style RT. Other nice take-aways for me from this are that my Twitter stream seems to use mostly positive words (Thanks, good and great are some of the most used words in my stream), and that I seem to talk to @dahowlett, and @monkchips most of all (and for some reason I seem to talk to myself (@tomraftery) a lot too – first sign of madness? Ok, now I have my archive down, I may need to do some more slicing and dicing on the Tweets – anyone have any suggestions for interesting things to look for? Also, I need to check if the archive download link which Twitter emailed me is a perpetually updating archive, or if it was a point in time link. Hopefully the former. My Twitter ‘Magic Number” is 16, what’s yours? Twitter is a superb medium for getting a message out. And it’s RT (ReTweet) convention means that tweets can go viral very quickly. However, if you want to be ReTweeted, you need to make it easy or people won’t do it. Well, if you have a tendency to fill up your 140 character allowance in your tweets, the chances are that you won’t be ReTweeted much – why? Because people wanting to ReTweet you will have to do work (edit the post) to get it to fit within their own 140 character limit! Reduce that workload by ensuring that your Tweet will fit within their 140 characters effortlessly and you will be ReTweeted more often. Hence the Twitter “Magic Number”. What is the Twitter “Magic Number”? It is the number of unused characters you need to leave at the end of your tweet so people don’t have to edit your post if they want to ReTweet it. My Twitter ‘magic number’ is 16 – I always try to write my tweets leaving at least 16 characters free at the end. this allows people to do a “RT @tomraftery: ” – so they can easily RT my tweets without having to edit the content to get it to fit in 140. Of course, leaving more than 16 spaces at the end of my tweets allows people to add a comment or bit of context to their RT which is even better. How do you calculate your Twitter ‘Magic Number”? 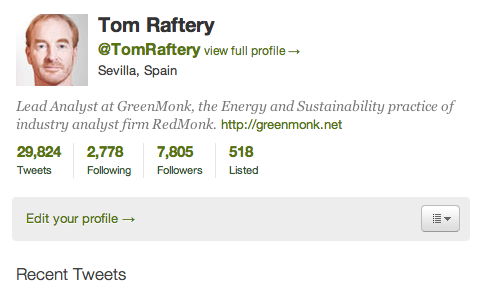 It is the number of characters in your username (11 for @tomraftery) + 5 (for the RT, the : and the requisite spaces). Now might be a good time to take another look at your Twitter username and see if you can find a shorter one that works – obviously the smaller your ‘Magic Number’ the more you can fit in your own Tweet, while still facilitating easy RT’ing! 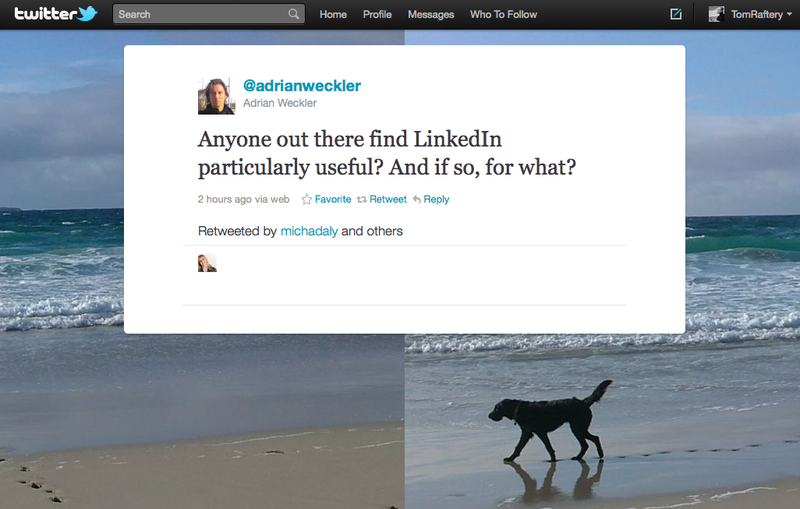 I was scanning Twitter this morning when I spotted a question from Adrian Weckler of the Sunday Business Post asking if anyone found LinkedIn useful and what for. I emailed Adrian the following story of how I used LinkedIn to help me get my current job. I’ve told this story quite a few times now but having finally typed it out, I might as well blog it as well, then I could point ppl to it!!! My wife is Spanish. She lived in Ireland with me for over 10 years before losing her head completely and saying she wanted to move back to Spain. That was in June 07. We had just enrolled our 4yr old in school for the coming Sept so we decided to give ourselves 12 months to organise the move – that way he’d also finish out his first year in school before we moved (don’t worry, I’m getting there!). I was involved in a couple of businesses in Cork at the time, but nothing that would move with me, so I knew I needed to cast around for a new job. One that would allow me to work from Spain in English as my Spanish was poor (still is, but that’s another story!!!). I put the word out on Twitter – but Tweets have a short half-life and that didn’t elicit much response. I also put the word out on FaceBook and I did receive on half-hearted offer of a possibility of a part-time position from a friend (but I think that was more a pity thing, than anything else tbh). Then I decided to try LinkedIn. I took a slightly different tack there. I had built up quite a decent network there of very well known people in the Web 2.0 space internationally. I went through the list and cherry-picked about 70 of them. I sent them an email saying that I would soon be moving to Spain (this was around March 08), and that as I’d be looking for a new position, it’d be great if they would consider writing a recommendation on my LinkedIn profile. Within a few short days I had over 20 stellar recommendations on my profile. And four job offers. I interviewed with the four and narrowed it down to two I was really interested in. Then RedMonk came along, matched the offers, and the rest as they say, is history!!! Twitter is a fantastic tool for disseminating information, and the obvious corollary of that is that Twitter is a superb app for consuming information as well – depending on how you use it. What is the best way to make sure you get the most information out of Twitter? Follow lots of relevant, interesting people! It sounds obvious (if you aren’t following people, you won’t see their posts) but I see lots of people on Twitter who are following 100 people or less. Many of those 100 will be friends and family, others will be infrequent posters so out of 100 accounts, you are lucky if 20 are regular sources of good information. Now, what if you increase the number of people you follow to 200? Or 2,000 (I’m currently following 2778)? Well then, the number of friends/family type accounts you’re following is unlikely to increase proportionally, so as long as you chose the people to follow wisely, you will vastly increase the amount of interesting news you will be receiving from Twitter. Now, I often hear people say they have difficulty keeping up with the number of people they are following and asking me how I follow over 2,000. The simple answer is I don’t try to keep up with all the people I follow! I dip in and out of Twitter and if the people I follow happen to post, I will likely see the post. If they post when I am not looking at Twitter, I probably won’t see their post. The major limiting factor in trying to follow more people on Twitter is obsessively attempting to catch every tweet. Let go. Learn to live in the now and more than likely if you do miss an important tweet, it will be re-tweeted anyway. Of course, a flipside to this is that you shouldn’t follow people simply to increase the number of people you are following. Only follow people who will bring you useful/interesting information – otherwise you are reducing the signal-to-noise ratio and similarly if you realise that someone you followed is not bringing you any value, don’t hesitate to unfollow them. So, how do you find interesting people to follow on Twitter? 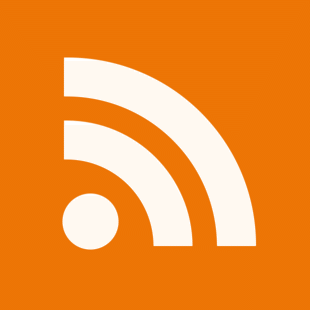 That’s a topic for another blog post – stay tuned! 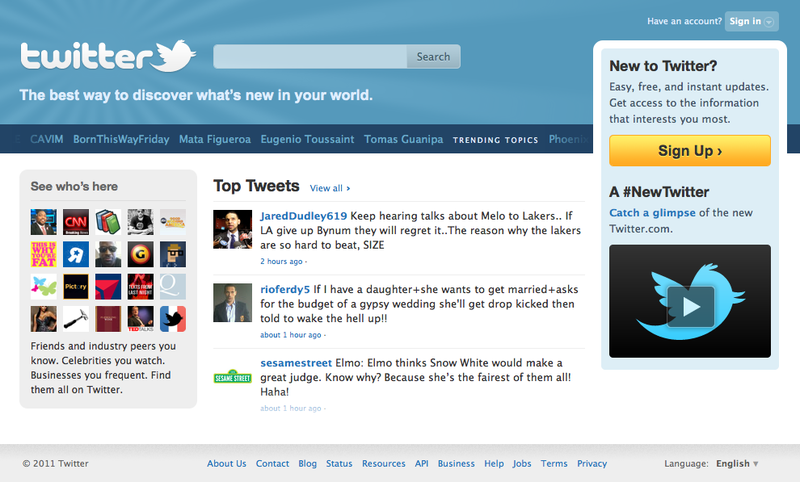 Twitterfone launched last night to a spectacular response. Mike Arrington gave it a glowing report on TechCrunch and the feedback has been very positive. What does Twitterfone do? Not much! It does one thing and it does it well. It allows you to dial a local number, leave a short message, the message is then transcribed and posted to your Twitter account along with a link to the audio file in case the transcription doesn’t quite come out. The best use case for this is in your car when you shouldn’t can’t browse! I have no idea how well it works if you are outside your own country but Pat being the king of roaming, I imagine he is all over that. It obviously had issues with my enunciation (although listening back, the quality of the line left a lot to be desired). Well done to Pat and the rest of the team for getting this up. I look forward to watching its evolution.